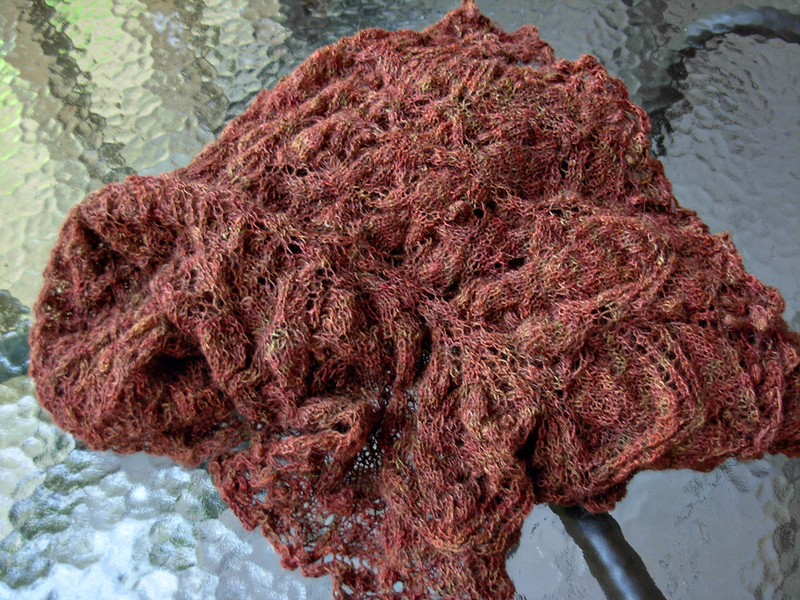 Well, it’s been quite a while since I’ve had a finished knit around here! 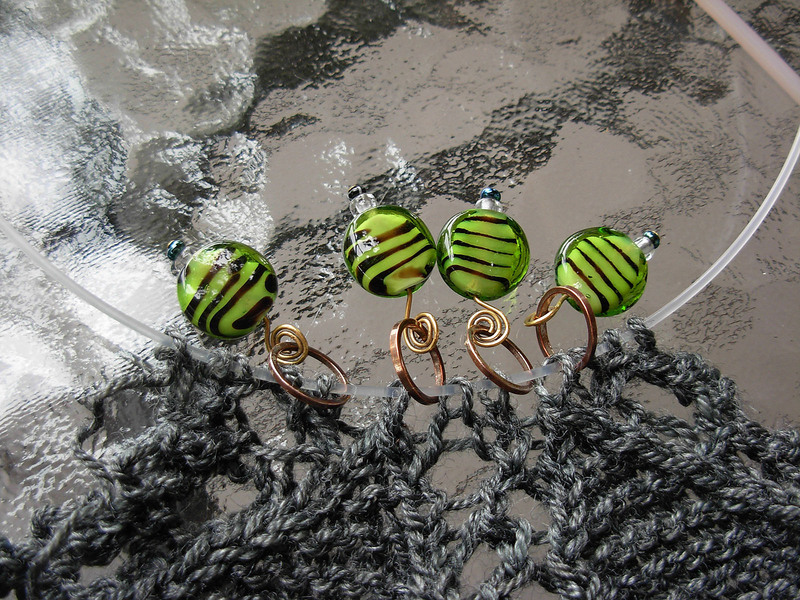 Glancing back through past posts, I’ve really fallen behind where I used to be in knitting productivity. 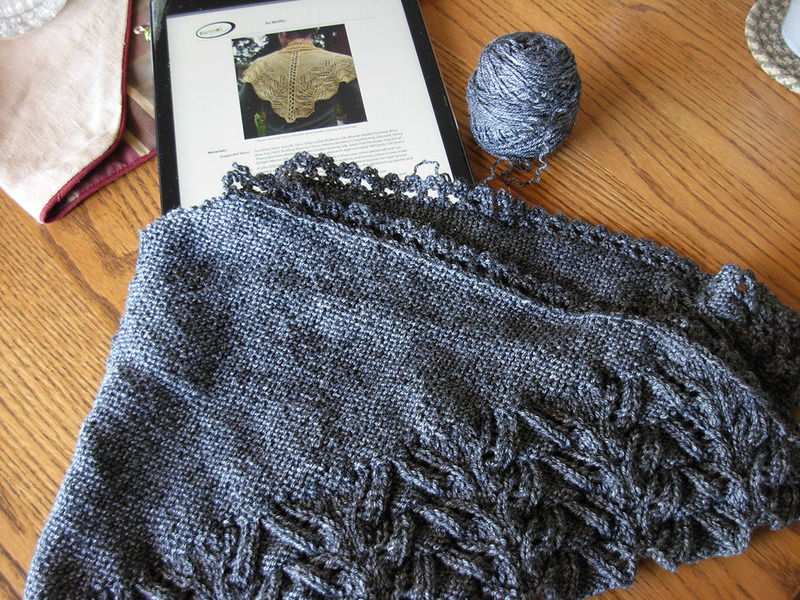 Thank goodness I started going to knit night; it’s been a great help in keeping me moving forward–even to finishing up those final little details like weaving in ends. The light is so good there that I don’t have the excuse of needing to wait for later (weekend daytime). I had it nearly finished over a year ago, but nearing the final stitches I realized that it was much smaller than the pattern states. Rip! 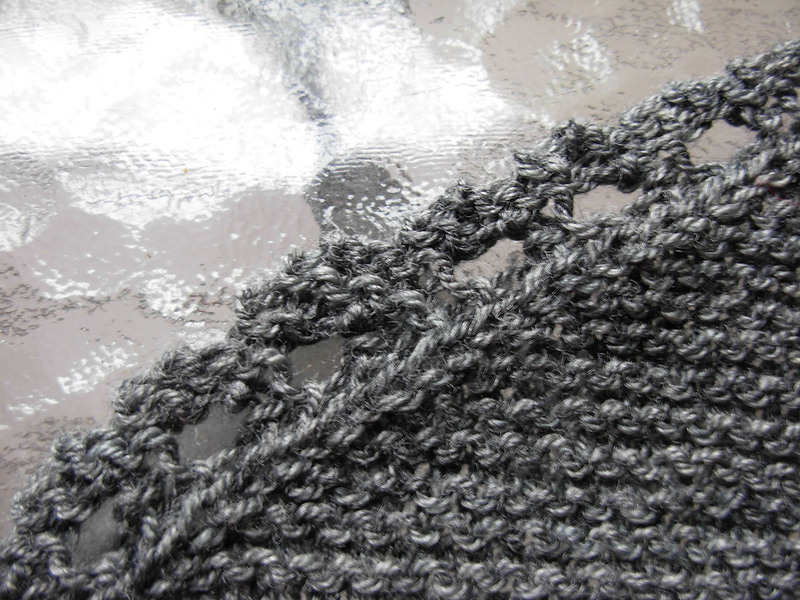 The second time around, I actually checked my gauge (good), knit off-and-on, and was just about to break the yarn for the grafting of the last few stitches (at the center neck) when I realized the count was off. 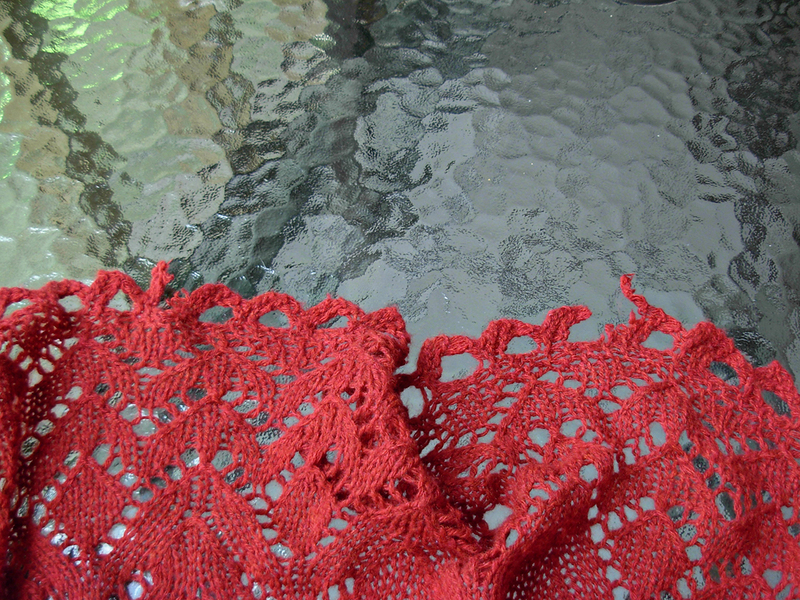 One too many stitches on one half of the shawl. The others at knit night tried to talk me into fudging the finish–especially as it took some time to find just where, exactly, the mistake had happened. Can you see it? It’s tricky. But there on the edge I had inadvertently added two rows to one repeat of the edging. Whoops! At knit night I did fudge. 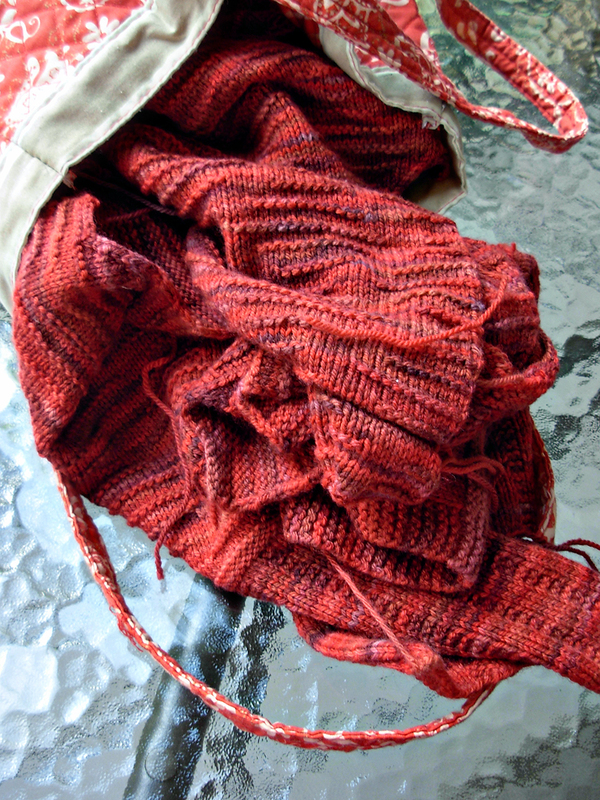 Knit two together, make the count work…and didn’t break the yarn. Not just yet; switch to the other project. 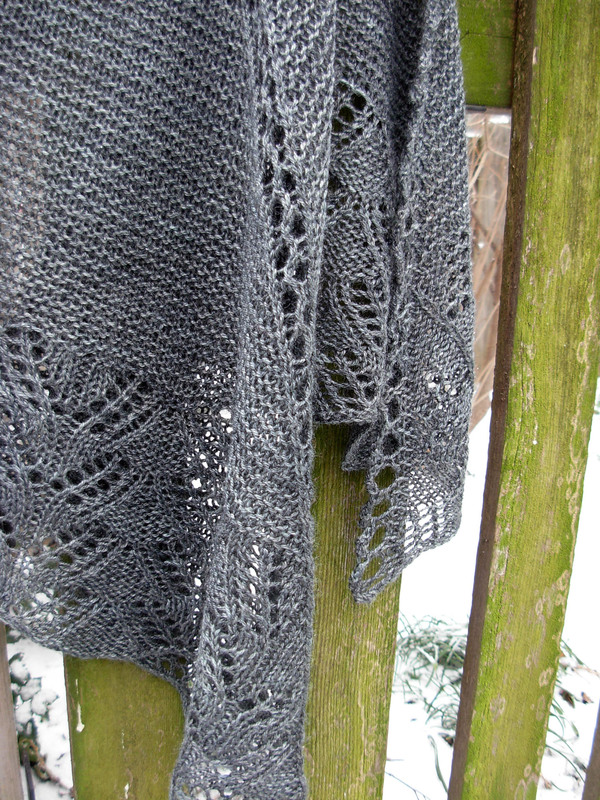 So despite all the drama, I’m very happy to have this little shawl finished. 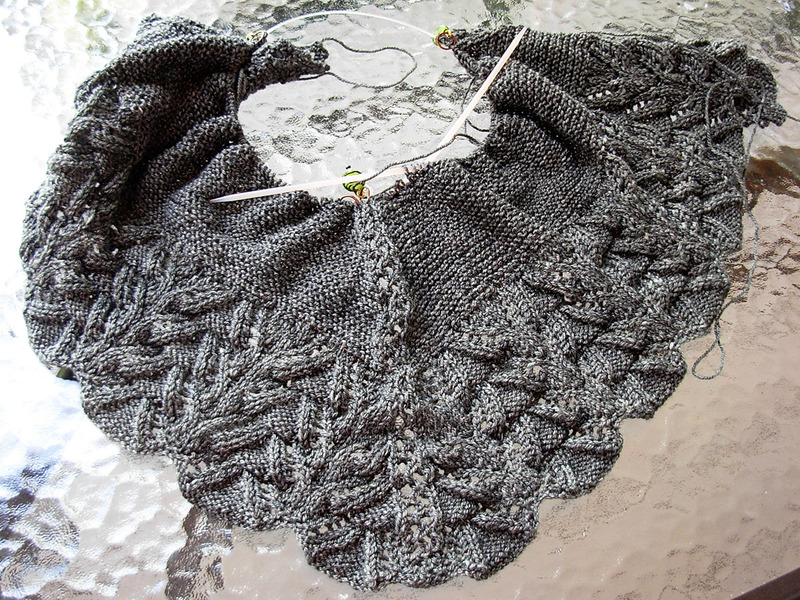 It’s still a bit smaller than the pattern size, but it was suggested that this was due to yarn variations–the pattern was knit in a slipperier yarn, which allowed the shawl to stretch more. But, I’m done, I’m happy, and now I have another little neck scarf for when the weather isn’t too cold. When I last posted, I was optimistic–about my ability to finish projects & my dedication to regular blogging. Ha to both! Well, mostly. I’ll post about the knitting…hiccups…at another time, but for now I wanted to share the entirely seasonal cross-stitch I DID manage to finish on time! Although this Santa isn’t quite as colorful as the first two I made, I do find the little mouse adorable–I even saved him for last. 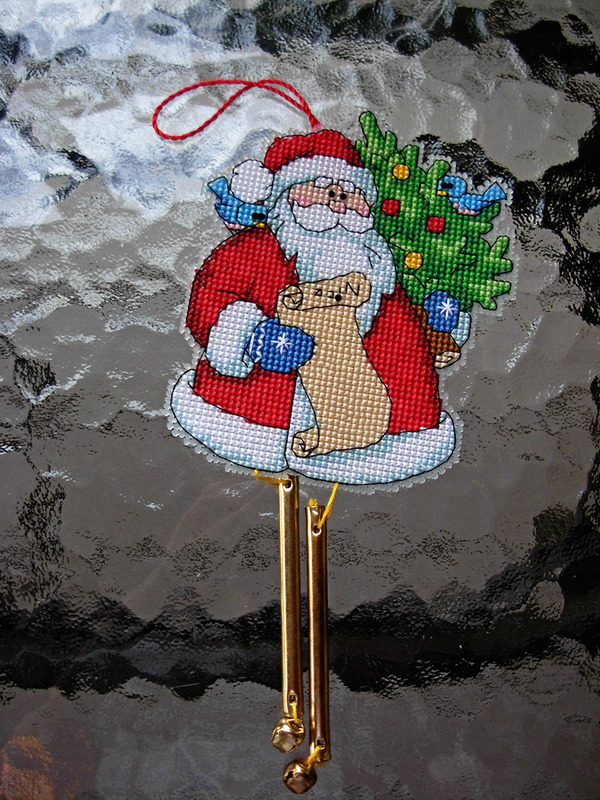 This marks the end of the cross-stitch kits–just in time to hang the trio of Santas up on the kitchen coat rack (an entirely spontaneous location that works really well). Now…what to make next? 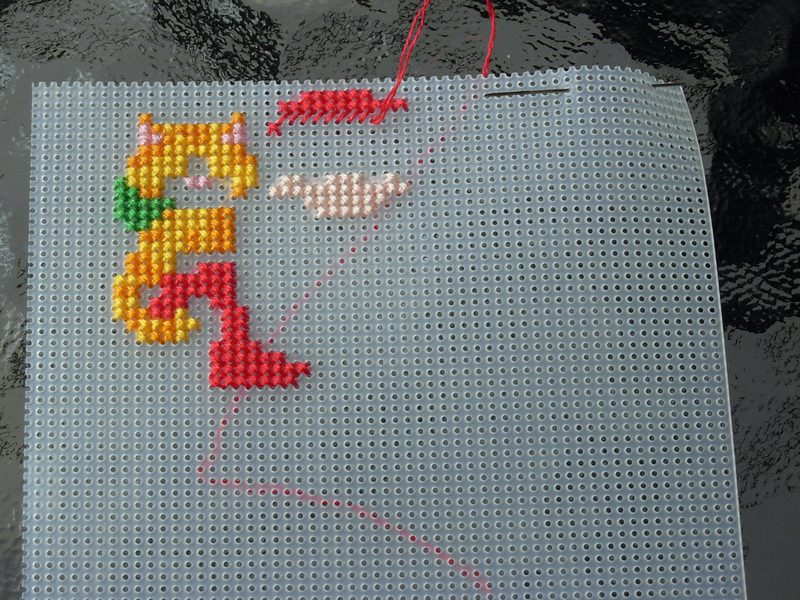 I’m almost down to nothing on the cross stitch needle as well. One of my goals for the year was to finish out, finally, the various Christmas kits I’ve had around and been working on off-and-on for years. And thanks to the need for some mindless projects last winter/spring and for not-so-warm projects during the summer month, I’m down to one kit left. It looks like I’ve not yet presented the recently completed projects here, though. This first is the bigger accomplishment – although the physical size of the snowman is not very big, all things considered, there are many details and shadings in the pattern. 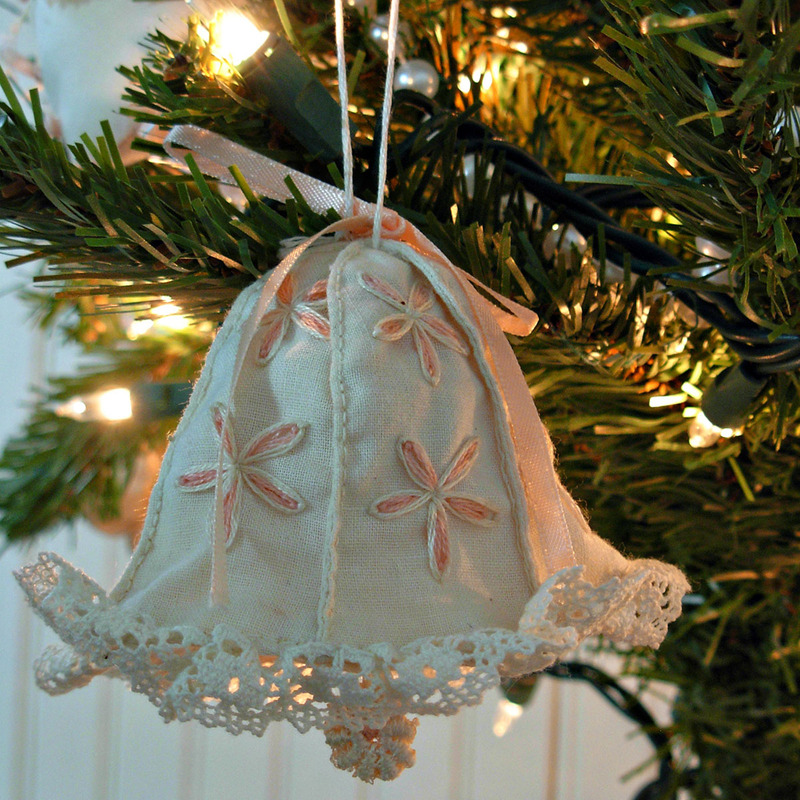 The trickiest part was the use of blending filament–those fine strands often want to fly away. The most frustrating part happened when I began the backstiching to outline the characters, specifically in the dark brown. It was only then that I realized how inferior the embroidery floss included with the kit actually is–it kept breaking as I was stitching. I finally gave up on the dark brown included in the kit and substituted something similar from my own stash of floss. Otherwise, I enjoyed the stitching but am very happy to have it done. Now I just need to frame it up in time for the holidays! I had this dreadful thought yesterday – I have no idea what the “next” project is going to be! Now, based on my recent project completion rate, and that I’m currently in the middle of two knitting projects, plus the miscellany, you mightn’t think this would be a problem. However. It has the potential. Despite my absence around here of late (how is it mid-September? – I’m quite sure it must be only July!) I have been working on things. And, more to the point of my next-project panic, I’ve actually started (well, okay, just once so far, but I have plans) to go to a Wednesday night knitting group. Which means I must have knitting for Wednesdays! This week–and until it’s finished, but once I conquer the problem of the too-tight cast-on, it will fly–the knitting will be the monkey bread hat for my mom. I’ve started and ripped out twice, plagued not by gauge so much as the cast on. Well, the first attempt was also slightly too small of gauge, but the second attempt would have been perfect (I went up one needle size), but the cast-on was tighter than the ribbed brim. All these years of knitting too loose, and now I can’t manage a cast-on! 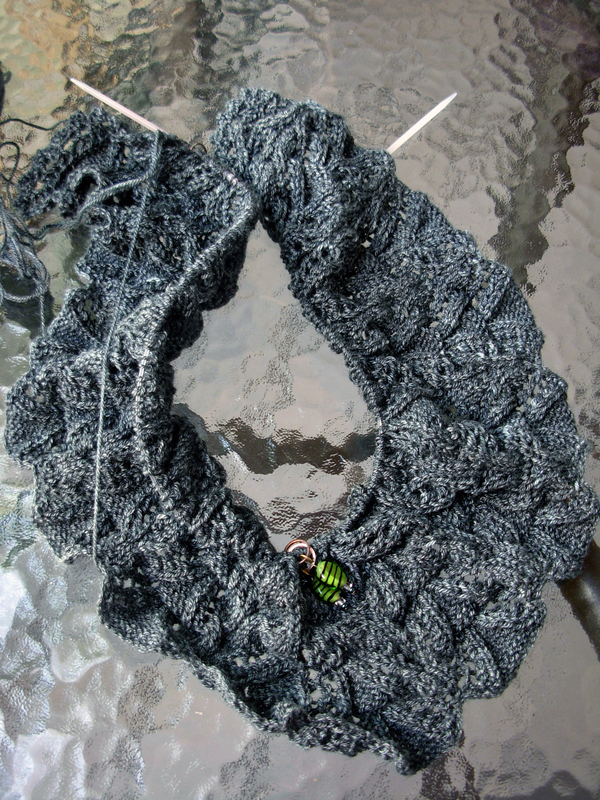 The other knitting still in process is my Les Abeilles. Also attempt two. I had a moment of panic this week, where it seemed that it was still too small, even though I had gone up a needle size. 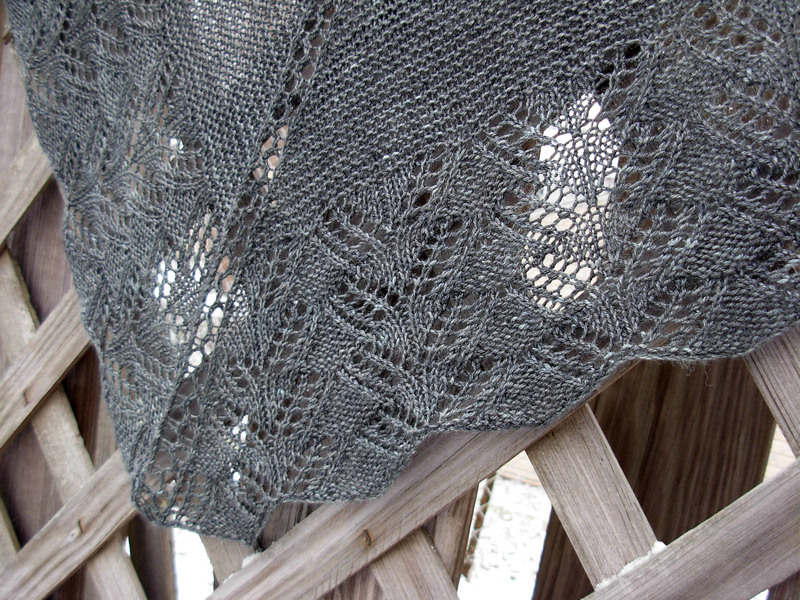 But the lace edging measures the correct depth, and I did a quick gauge “square” in the middle of my knitting and I’m dead on, so it may just be my mind playing tricks on me. Regardless, I decided that whatever size it comes out I will use, so full steam ahead. The blocking will tell in the end. 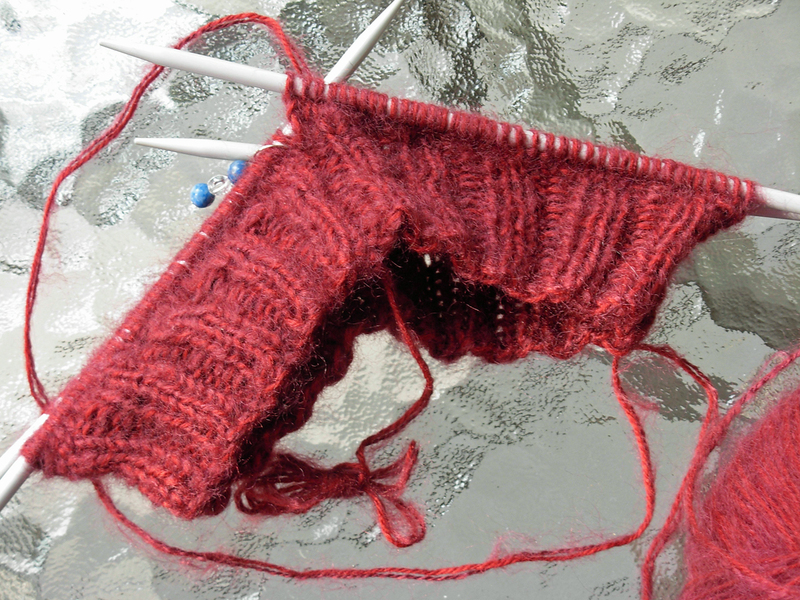 But as far as actual on-the-needles knitting, that’s it. And no plans for what’s ahead. It looks like I may have to spend some quality time with my Ravelry “favorites” this week. (I don’t really keep a “queue” as I did for a while and it became both ridiculous and inaccurate.) And maybe a stash dive. That usually proves inspirational! So I’ve been poking around my project basket lately, and realized that I really needed to take stock of what was/wasn’t in it. And what I should really be trying to finish up. The first two projects aren’t so much in my basket as they are adjacent to it. 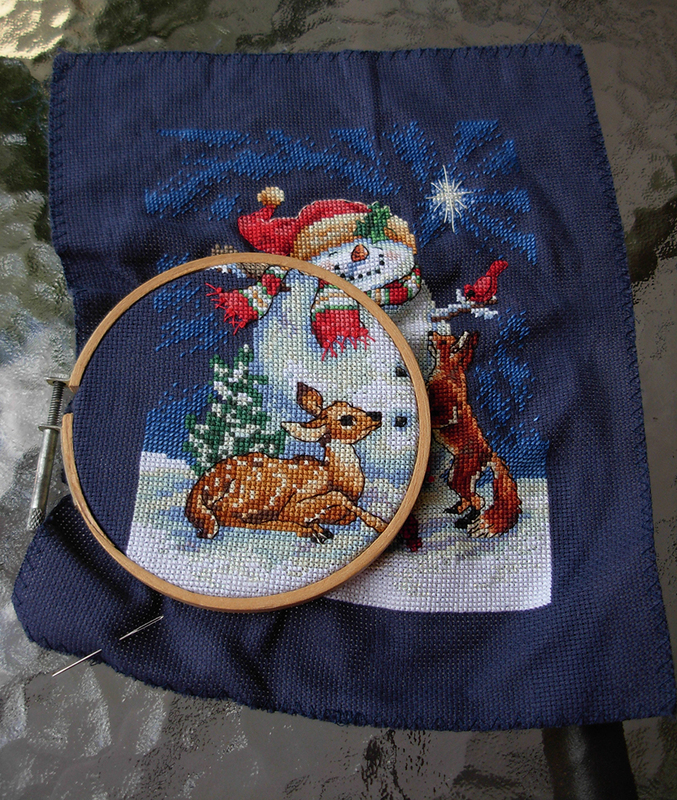 I’ve been working on the cross-stitch snowman forever, but it’s down to some backstich (mostly on the tree) and French knots. 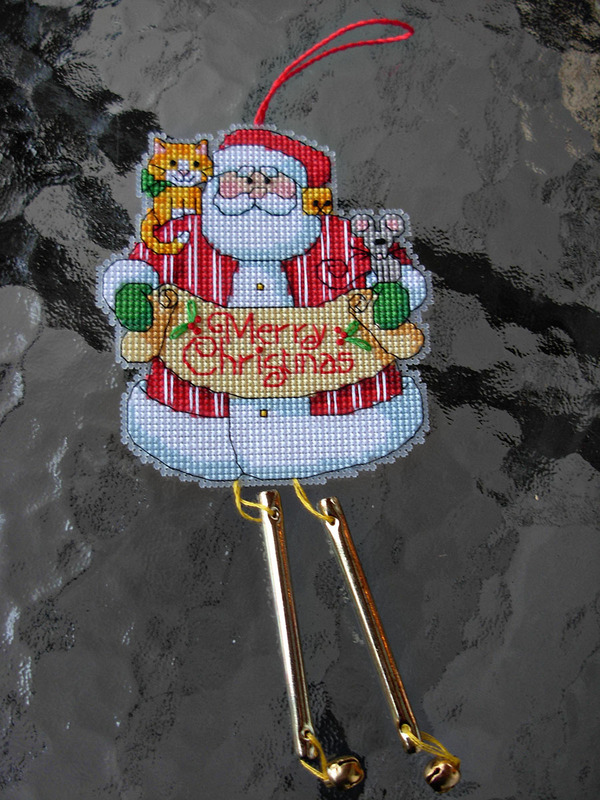 The Santa with a cat is a newer project, but I’ve had the kit as long as I’ve had the snowman kit. So it’s time to be done! 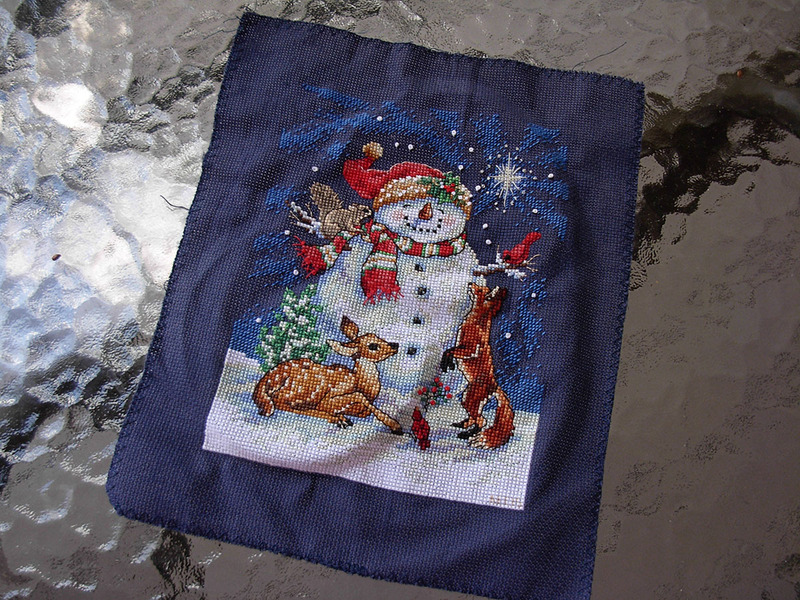 Although I cross-stiched quite a bit this winter, I stopped to save them for when it’s too hot to knit. Which might include today–not that it’s so terribly hot, but it IS very humid. In the category, “isn’t this done already?,” there’s my Aeolian. Which is done. Exept for blocking. I’ve been on a roll of washing and blocking shawls lately, and I think I have enough room to block this if I double it, so there shouldn’t be any reason I can’t be completely finished with it by the times it’s cool enough to wear it. The sweater, Ondulé, whose seaming I’m avoiding. (And I need buttons. I’ve looked locally, but haven’t found anything yet.) There’s another sweater pattern I’d like to knit–and I even have the perfect yarn–but I think perhaps I should actually finish this first. Ahem. I just need to plan to sit down and do this some Saturday. 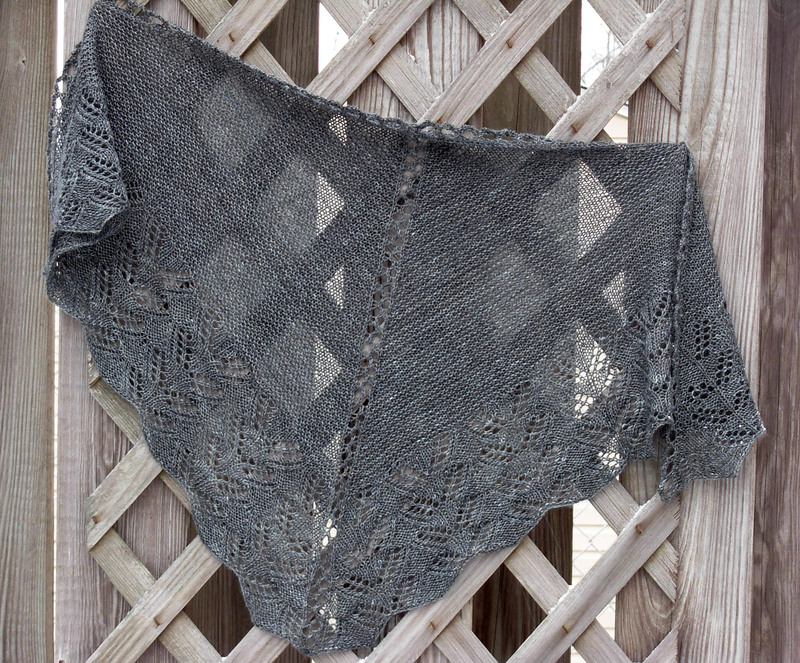 So…I was almost finished with my Les Abeilles back in November. I was slightly concerned I might not have enough yarn, as I don’t have as much as the pattern calls for, but I made it to the last row with plenty yardage to spare. Too much! I could tell, just spreading it out a bit that it was going to be as small as the smallest pattern size, even though I knit the middle. Shoulda checked the gauge. Oops! So it looks like this now, after I ripped and restarted. I’m through the first chart. I’ll still have the yardage concern, so I’m going to add a lifeline in before I start the next section–if I run out, I’ll change the decrease rate in the gartar stitch portion. I’m not worried about finishing, as this has been my go-to project when I’ve been looking for something that doesn’t require any thinking lately. Then there’s this: my Girasole, finished several years back–and hurt. I don’t know what happened; likely I snagged it on something and tore the fragile cashmere. I have plenty of yarn so I can repair it, but it will take some thought to work out. So I’ve been avoiding it. For over a year. So, again, something to just plan to do some weekend. Before I want to wear it again next fall! Finally, something new! 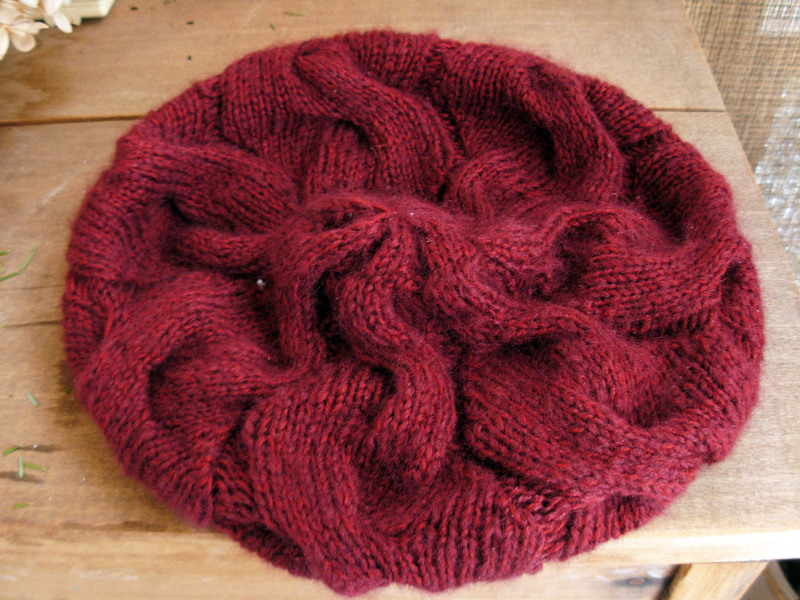 This is another Monkey Bread hat, this time for my mom. I think I need to restart, as the brim seems too tight. (Not sure if it’s just the cast on, or if I should go up a needle size as well. Regardless, I really want to get it finished for my mom by next winter. There’s no reason I can’t as long as I stick with it. But otherwise – nothing new! 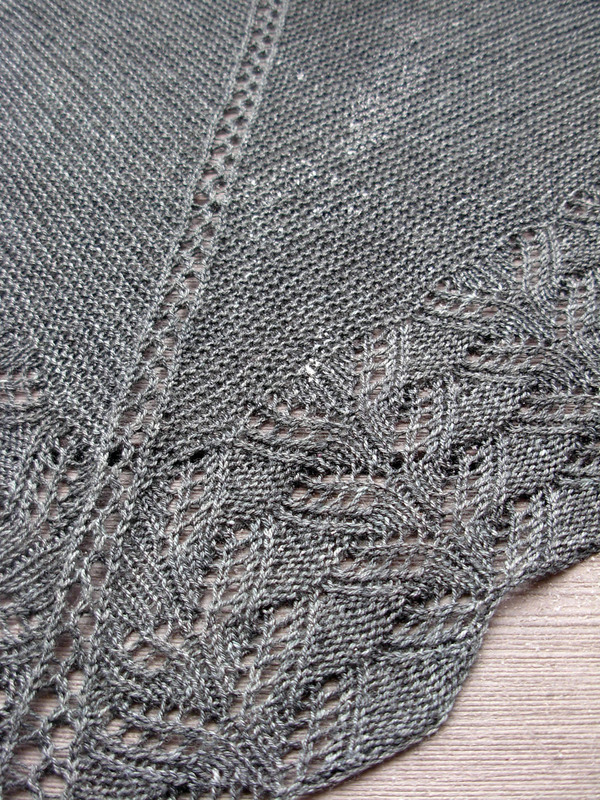 No new lace, and I’d like to have another project on the needles. I don’t know what yet–but I think perhaps that’s okay as I really should finish off some of these first. After all, I don’t have any good excuses not to!